Unique property opens onto lush outdoor space offering both privacy and intimacy. Lush terraced gardens include Weber outdoor grill, a kitchen center with sink,and Mexican tiled counter tops to facilitate outdoor meals. The outdoor shower is intertwined with jasmine, heirloom roses, and succulents that have been maturing for over 40 years. 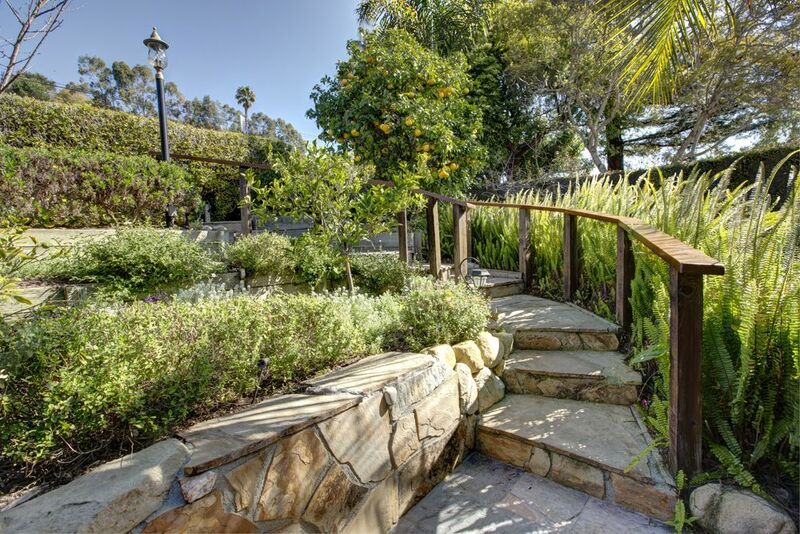 Elegant plantings with orange, lemon, grapefruit, avocado, and cherimoya trees cascade three levels down from the house. The newly renovated main house is both airy and luminous, with Brazilian Koa floors and recessed lighting throughout. The main house features three bedrooms with 400 count thread sheets, and tasteful decor.Two bedrooms also have views and access to gardens with 6’ sliders and patios. A top of the line, fully equipped kitchen includes granite counter tops with stainless steel appliances and Bosch dishwasher and center aisle cook top with separate convection oven and microwave. The master bath includes travertine marble tiling throughout with double sinks, and spacious shower area. The open floor plan boasts a step down living room with Colorado stone fireplace, exotic wood mantle and flat screen television. Former tennis pro and massage professional. Love orange,lemon, and graprfruit trees on site. I grew up in Chicago and currently spend 1/2 of each year in Vermont and the other half in Santa Barbara. Convenient central location,beautiful gardens, quiet and peaceful. Private multi-level patios .A large number of fruit trees and succulents. A little bit of heaven. 4 + spaces in driveway as well as street parking. There are 4 beach towels. Gas fireplace available in winter months. 2 level with large sectional and additional sitting area. Kenmore Elite side by side. Bosh cooktop and convection oven. Large dining table with breakfast bar and stools. 55 inch flatscreen has Dish Network and available Roku. We were in Santa Barbara for a niece's wedding and chose to stay at Eucalyptus Hill. We had a wonderful time and one of the reasons was this house! The beds were super comfortable. The kitchen and living areas were large and open. We had easy parking on property for our cars. The neighborhood was quiet. The best part of the property was the gorgeous terraced backyard with every kind of succulent possible. We felt like we were in our own secret garden. Roger was awesome to work with which made our stay stress free. I would highly recommend this property. The grounds and the house were spectacular. The location was ideal. Would recommend it to anyone looking to stay in Santa Barbara. Our stay was amazing, plenty of space to hang out outside along with a beautiful setting. Very relaxing and in close proximity to everything! We really enjoyed our time at this property. There was enough space (and outdoor space) so that our group never felt crowded. The backyard space was gorgeous, and the kitchen was great to make food in. Thank you for the wonderful time! A beautiful, clean home and guest cottage with fabulous gardens front and back. This vacation home is located on a quiet street that has no through traffic. It is close to the beach and zoo, and minutes away from downtown State Street. My grandchildren had a fun time exploring the garden in the back yard, which was gated and secure. The adults enjoyed the many outside areas to sit and relax and watch the hummingbirds. Inside the house, the kitchen is well stocked, the bed linens and towels are upscale. Great place! Thanks to Roger for making this a hassle-free experience. Central to everything in Santa Barbara. Beaches are amazing. Mountains equally beautiful. Great variety of restaurants and prices. Walking distance to Grocery Stores, gourmet coffee shops, upscale shopping, bakeries, P.O., hair salon, yoga etc.